This blog is now located at http://rickborup.blogspot.com/. This blog is moving, stayed tuned for more details. Unlike IE7, Internet Explorer 8 does not offer to remember open tabs on shutdown. But after re-launching IE8, you can restore them by going to Tools > Reopen Last Browsing Sesssion. The Visual FoxPro Task Pane Environment Manager enables you to set up the environment you want to be associated with each project. Among other things, you can specify the project file, the default directory, the path, the resource file, and any environment settings that may be unique to each project. When you click the link to a project file in the Task Pane Environment Manager, VFP applies your settings and opens the project. However, the Task Pane window remains open and visible on your screen. If you don't want the Task Pane window hanging around after your project has been opened, there's an easy way to make it disappear. 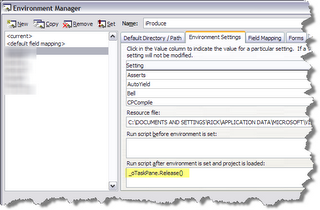 Select a project in the Environment Manager. Click on the icon to modify the environment set and select the Environment Settings page, as shown in the screenshot. Notice there are edit boxes for two scripts, one that runs before the environment is set and the other that runs after the environment is set and the project is loaded. 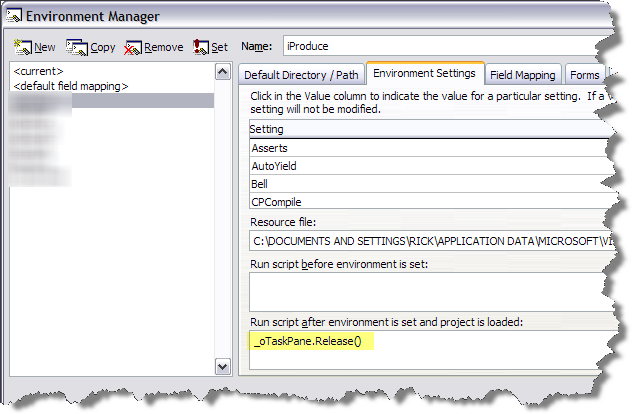 To automatically close the Task Pane window, simply add "_oTaskPane.Release( )" as the last or only line in the script that runs after the environment has been set and the project has been loaded. Click OK to save your changes. The next time you open the project from the Task Pane, the Task Pane window will automatically close after the Project Manager window opens and you'll have a clean screen to work with.